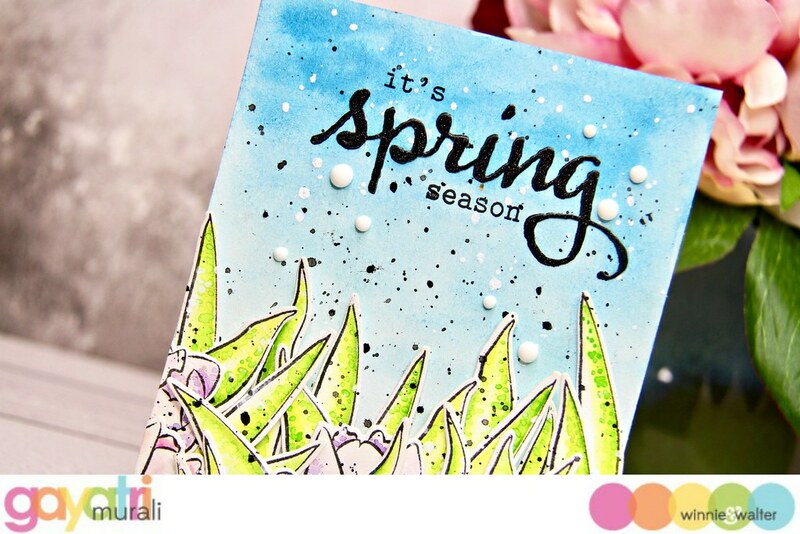 Today I am sharing a spring card because I and several others in the southern hemisphere are in the spring season. After a few months of heavy rain, cold, windy and no sun whatsoever, its is awesome to see the sun out, warmth and lots of flowers around. To celebrate the season, I made this card using Winnie & Walter products. 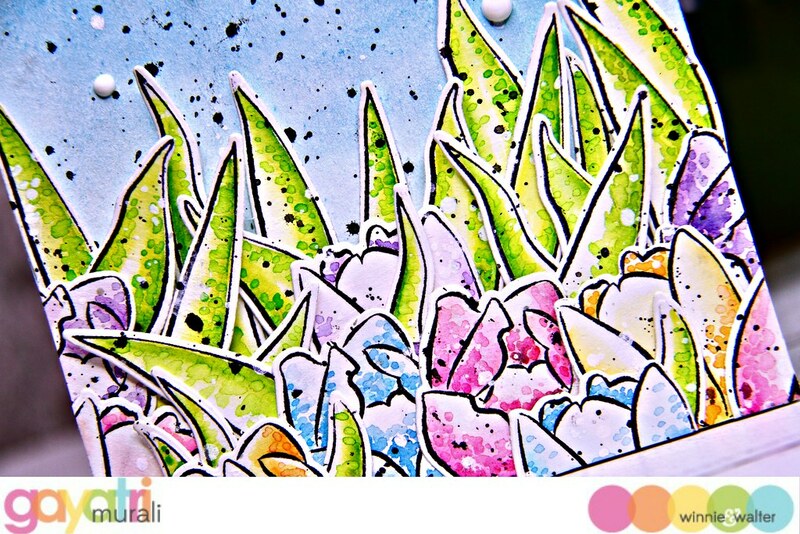 I did some messy watercolour on the gorgeous tulip and leaves images from In Bloom: Addie’s Garden stamp set. I stamped the images on watercolour paper using Simon’s intense black ink. This ink is great for watercolouring. Then I used Zig clean clear brush pens to add the first two layers of the watercoloring on the images. Then I used the Migello Mission watercolours to add texture to the images. I let the watercolours dry. Then spattered with black and white Altenew spray and left the panels to dry. Once dry, I used the coordinating cutaways to die cut the images. For the background, I did a blue ombre watercolour, dried it and spattered with black and white Altenew spray. After the panel is completely dry, I adhered the die cut tulips and leaves on the bottom of the background panel using glue and foam adhesive for dimension. 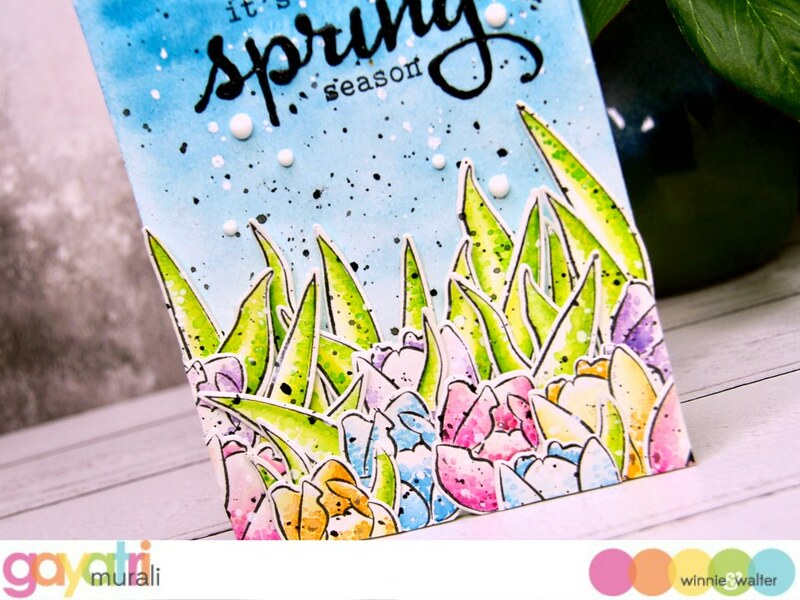 For the sentiment I die cut the Spring using The Big, the Bold and Seasons cutaway using black glitter cardstock. This is my main sentiment. 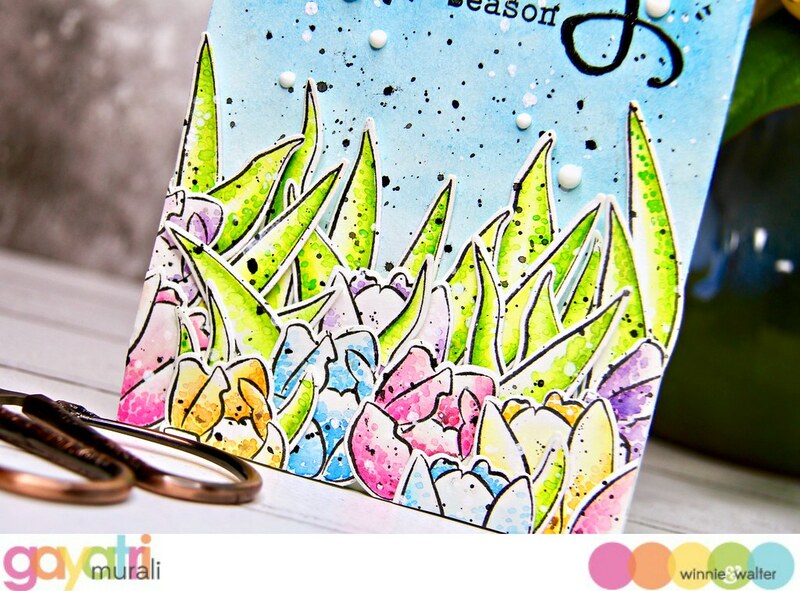 The secondary sentiment is from The Big, the Bold and Seasons stamp set which I simply stamped on top and bottom of the main sentiment die cut. Finally a few white Nuvo crystal drops to finish off the card. 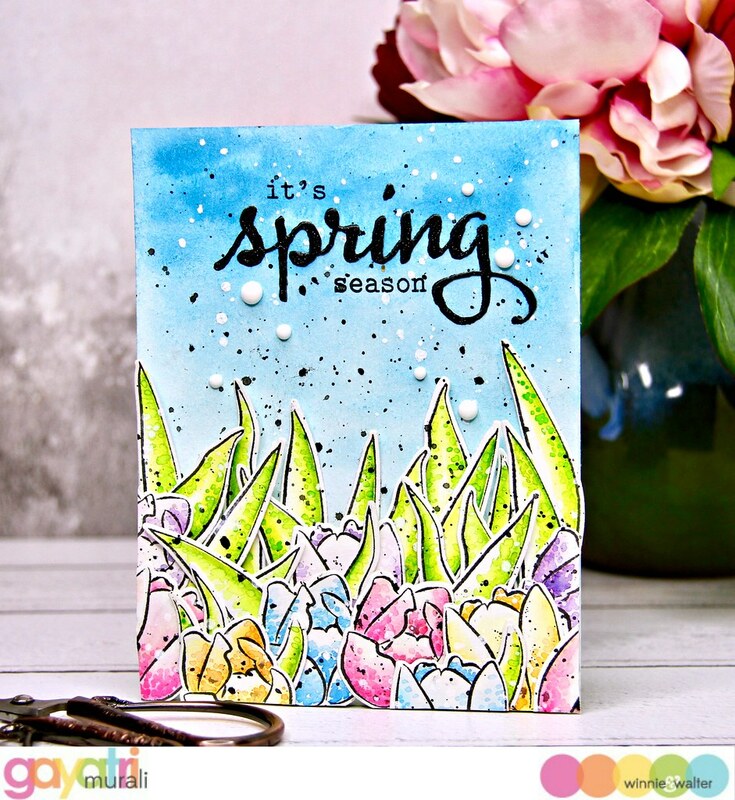 Hope you like my messy watercoloring and a very colourful spring card. Thank you very much for visiting today. Beautiful, love the look of alcohol markers. Now maybe I can actually afford to invest in some. What a beautiful card, your coloring is so pretty. 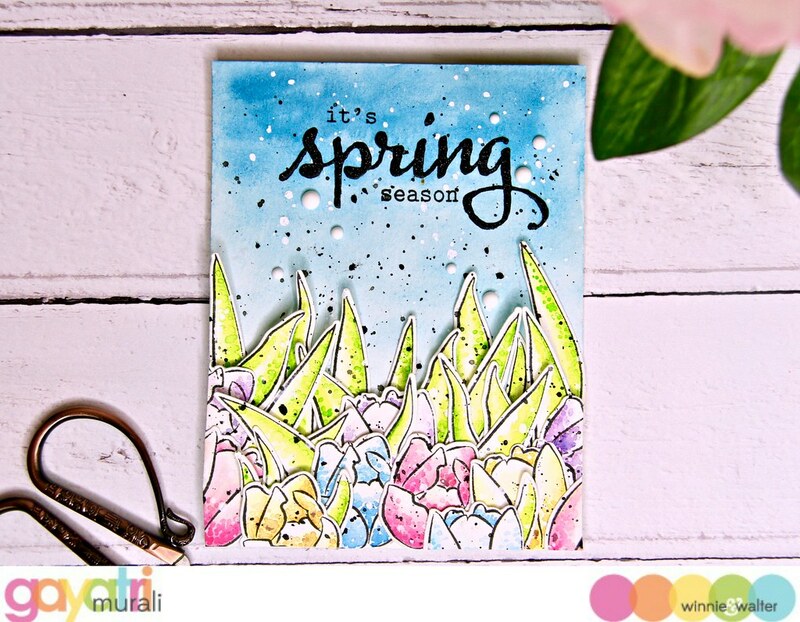 It’s a rainy fall day here, so enjoyed your “Spring” card. Such a bright and beautiful card!